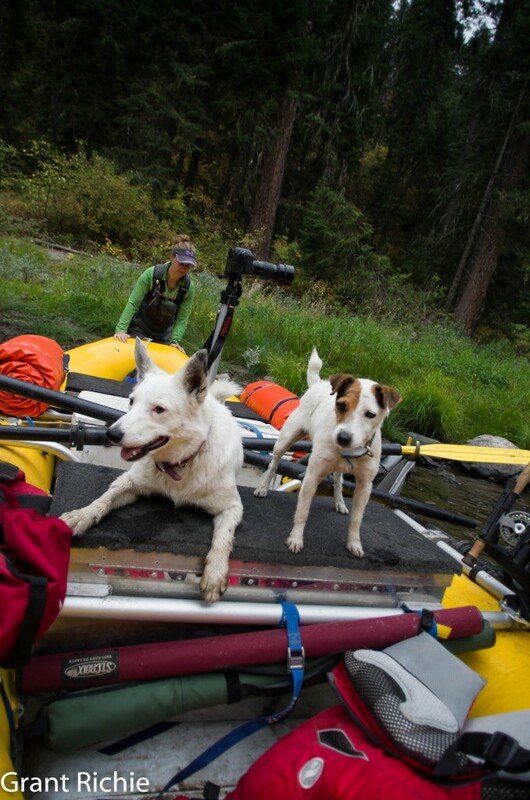 Low water rafting trips on the Grande Ronde can be a lot of fun. What’s even more fun is low water rafting trips where you catch steelhead. Low water for purposes of the Grande Ronde is somewhere below 750 cfs. From 750 cfs up, the Grande Ronde is pretty manageable. Below 750 cfs and you better pack light, have excellent water reading skills, and be a good rower. Oh, and be willing to get out of your raft to push it off that barely submerged rock you didn’t see when you were gawking at the bear or eagle by the river. You should also be prepared to get out and walk your boat through some shallow gravel bars. The lighter your raft’s load, the better your rowing skills, and the better your water reading skills the easier time you will have getting down the river at low water. Lottie and I headed down the river to search for early steelhead with the river gauge running at 550 cfs. 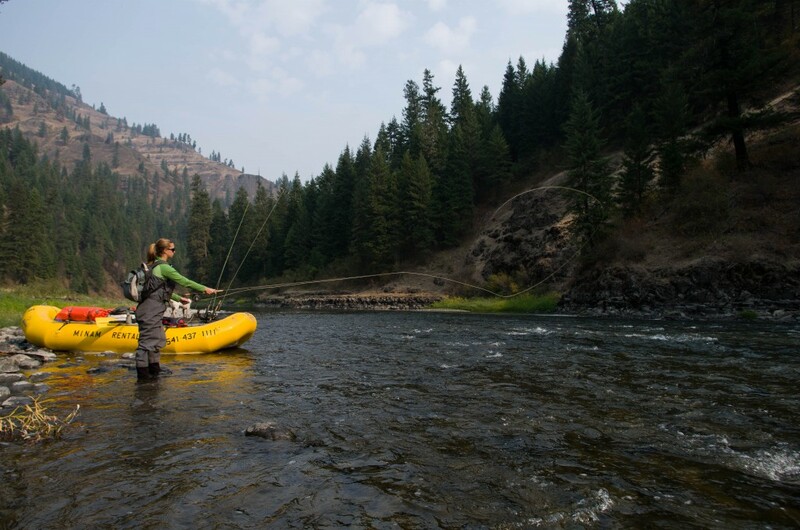 Last year we floated it in late September also looking for early steelhead, but the river was around 600 cfs. This year the river has dropped lower into the 500 cfs range and we simply haven’t had any rain to help keep flows up. We did a family trip in late August with our kids, our neighbors, and their kids. That trip the river was still in the mid 600 cfs range, but we packed very comfortably and paid for it by getting stuck a lot. Over a month later with the river now 100 cfs lower, I did not want to be getting stuck a lot. Lottie and I packed more like backpackers than rafters to keep our raft riding high and make the floating easier. Our first day on the river we set out from Minam about 12:30 and I was happy to find that we were gliding over shallow gravel bars much easier than our last trip. This trip was just Lottie, me, and our two dogs. We sailed past the Wallowa without fighting the shallow rocks too much. I was rowing and Lottie was just riding along. I kept threatening to make her row if she wasn’t going to fish. Someone should have been enjoying the good fishing along the Wallowa section and I can’t fish and row at the same time. We did see 3-4 elk beside the river with one bull in the bunch. 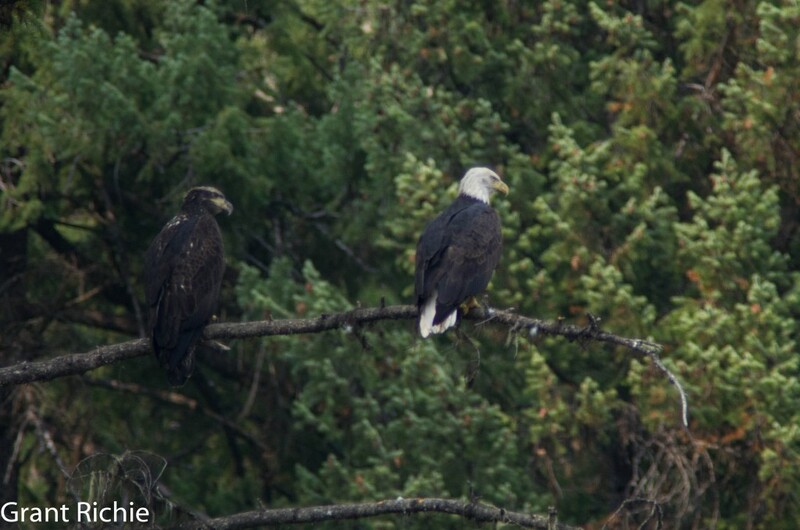 The eagles were out in force again as well and I even got a picture of two in one tree. 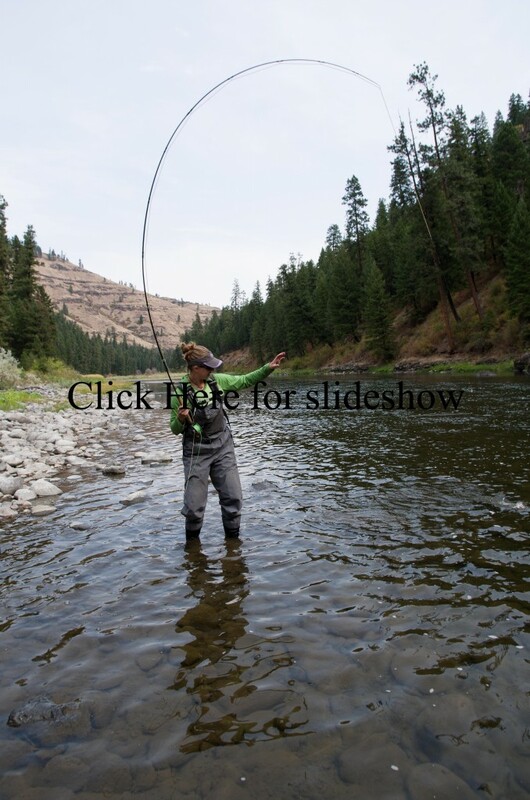 Once to Rondowa and the Grande Ronde we broke out the fly rods and began fishing. As I was fishing downstream of the railroad bridge Lottie went for a short walk up the tracks. On her way back she hollered to me something about a bear. Apparently I had a bear for an audience. He was at the confluence between the Wallowa and the Grande Ronde while I was just a ways downstream. Lottie said he was standing up on his hind legs just watching me fish. I was concentrated on fishing though and did not notice him. When she hollered that there was a bear I simply said “OK, get a picture of him” and kept fishing. I have seen lots of bears and I was more focused on trying to catch my first Grande Ronde steelhead of the season. Rondowa only produced a couple of northern pikeminnow on my flashback stonefly so we headed downstream. Next spot we stopped was much better trout water anyway and Lottie had a 16” plus rainbow jumping out of the water almost immediately. I hooked into several heavy fish that I never got to see and then hooked a hog of a rainbow that began leaping out of the water as well. Lottie’s rainbow was nice, but this one I had on was a pig. It looked like an 18” long football each time it jumped. Unfortunately my fat fish came off during one of its leaps so I didn’t get to take any pictures of it. We kept working our way downstream and I was reminded why I like fishing the Grande Ronde so much, there are a lot of big trout in there. Below Sheep Creek rapids I hooked into my first steelhead as well. It was a healthy native that exploded out of the river many times before finally coming to the bank. The amount of red on the steelhead was very surprising for how early in the year it is, but it was a beautiful healthy fish with lots of fight. I caught it on a Strip Leach which is a Gary Borger fly that is similar in some regards to a double bunny. When I finished fishing below Sheep Creek rapids it was high time to find a campsite. 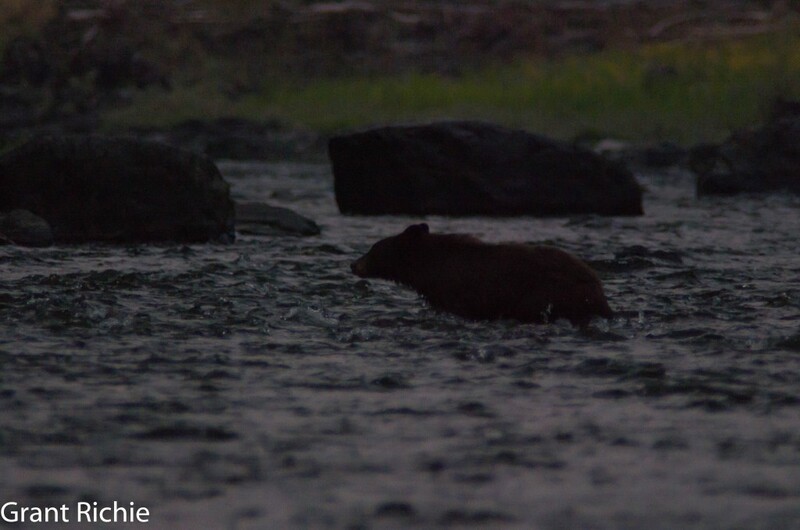 As we made our way around the next bend there was a bear on river right that didn’t see us. It meandered downstream for a ways before deciding to cross the river in front of us. After crossing, he still didn’t see us until we were nearly beside him. At that point he ran up the mountainside. We made it to camp as it was getting dark and made dinner and camp in the dark. Not a bad first day of the trip though, lots of eagle sightings, two bear sightings, many rainbows pushing 16” and a very healthy sized steelhead and it isn’t even October yet. Day 2 started out good as well. I hooked and played two steelhead before noon. Too bad I didn’t get one of them landed. As we progressed downstream we stopped at only the best spots to fish. Throughout the day Lottie and I both hooked many and landed a few nice rainbows. 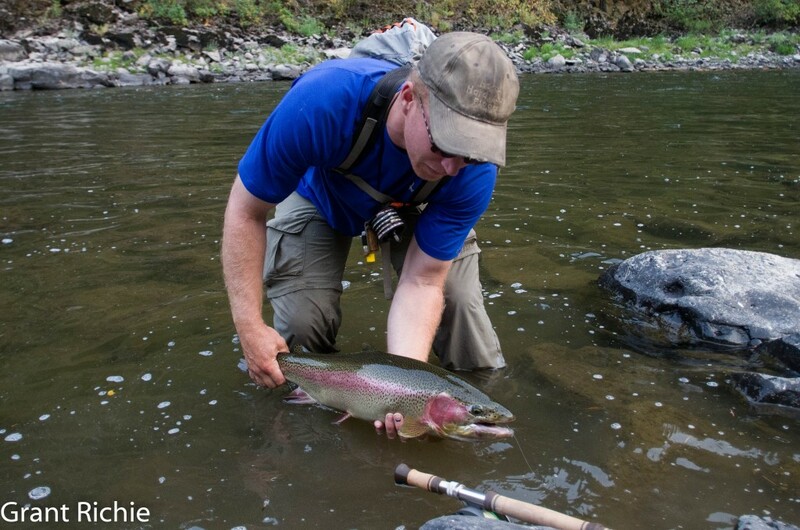 One of the best ones, I wasn’t sure whether I had a small steelhead or a large rainbow on until I got it landed. It was a nice fish to say the least. We saw another small bunch of elk with a bull again in the group. Near Meadow Creek I noticed an eagle sitting in the tree opposite of the creek. I took a bunch of pictures from the raft and then landed the boat and took some more while Lottie began to fish. Eventually I decided I had taken enough pictures of the eagle and got my rod out and began fishing. Not soon after Lottie was hollering that she had a steelhead on. This one was a fat, bright hatchery hen that took a flashback stonefly. Just above Martin’s Misery I began rowing the raft to shore to fish when Lottie hooked a pikeminnow. As I beached the raft Lottie landed and released her fish. Loca, our Jack Russel, however didn’t think we should let that one go and dove off the raft into the river and swam after the fish. This was especially funny since Loca hates getting wet. She is more like a cat when it comes to water and will usually tip toe through any water she has to go through. But she loves going fishing. She will sit by your feet staring intensely at the water, waiting for you to catch a fish. She will also occasionally try to bite your fly if it goes whizzing by her. She in fact caught Jeff’s fly out of the air last weekend when we were on the Imnaha. She did not get hooked luckily. If you let her get too close to fish she will also try to take a bite out of them. But if I just tell her to get back, she does and the fish are safe. Some October Caddis have been out each day, but as it begins to get dark they come out in large numbers. For anyone who is unfamiliar with the October Caddis hatch, October Caddis are huge orange bellied caddis flies. Unlike some species of caddis, the October Caddis do not hatch in stream. About two months before they hatch they encase themselves on a rock and go through a pupa stage. They are not available to trout during this pupal stage and when they are ready to hatch they crawl to the bank at dark and hatch. If you look at boulders near the stream you will see their shucks left on the rocks. I have always been a little dubious about October Caddis pupa patterns since the big bugs crawl to shore at night to hatch. But some may well get washed into the current and become available for trout. If any of you have a favorite October Caddis nymph tell me about it in the comments section at the end and I will give it a try. Sunday morning I had to do more rowing than fishing to get us to the take out at Powwatka Bridge (also called Wildcat Bridge) at a reasonable time. We still stopped and fished some of the best spots. 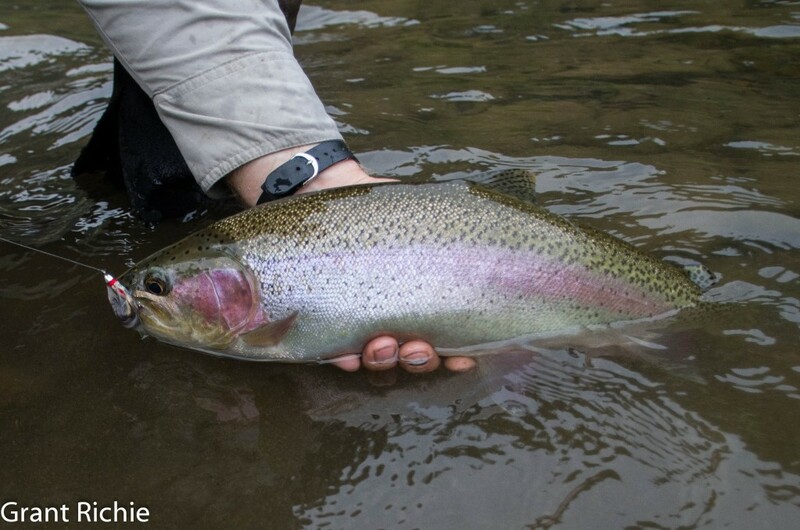 I caught a fin-clipped rainbow that I had a hard time telling whether it was a legal steelhead (over 20”) or not. As I was staring at the fish trying to determine its length, he wiggled free and was spared going into my smoker at home. The rainbow fishing was unbelievably good all weekend. The Grande Ronde between Minam and Powwatka Bridge may be our very best big rainbow water in eastern Oregon. With 39 miles of no roads, fishing pressure is limited and the scenery and setting unbeatable. This stretch of water is catch and release for all wild rainbows which makes a big difference in the quality of the fishery. 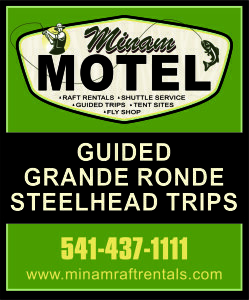 I will again be fishing and floating our section of the Grande Ronde religiously this fall for steelhead. 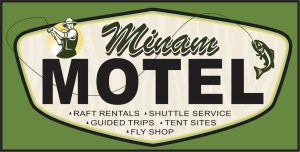 I am now offering guided trips through our raft rental business at Minam. Anytime between now and winter is a great time to do a guided fishing trip. We have prices for all inclusive guided trips on our raft rental website, but I can customize any trip for how much or how little you would like to do. 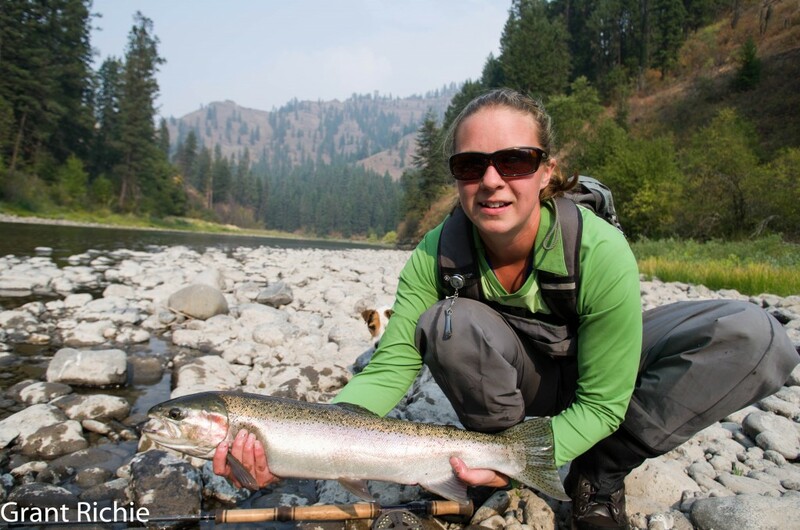 Whether you want everything provided for you and simply want to show up and fish or if you want to provide your own food and camping gear and simply have me there to guide you through the low water and show you the best locations and techniques to catch steelhead, I can customize the trip to your liking. Just send me an email grant@minamraftrentals.com with your inquiry. Click the picture below to see more pictures from the weekend. This entry was posted in Grande Ronde River. Bookmark the permalink. What a great report, thank you for posting it. This is exactly what I was looking for in order to give me confidence that the steelhead will be around for my trip to the Troy area in a couple weeks. If I ever need a guide for the float from Minam to Wildcat, I now know where to go. Thanks again and tight lines! Thanks Jason. There should be a lot more steelhead in that section in a few weeks. That rainbow is not fat…it’s phat. GR bringin’ it on the Ronde! Thanks Greg. Hope your trip up north went well! I was the only person in the entire hike-in section of a well-known cutthroat fishery for four days…’Nuff said! You don’t want me to tell everyone about the North Fork of the East Fork of the Grande Ronde? Lets just hope there are enough people who know and care about it when they decide to mine it for gravel, gold, or whatever valuable rock they decide is worth a few dollars.